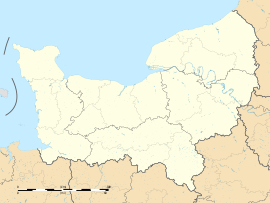 Brémontier-Merval is a commune in the Seine-Maritime department in the Normandy region in northern France. A farming village situated in the Pays de Bray, 26 miles (42 km) east of Rouen, at the junction of the D84, D284, D21 and D145 roads. The seventeenth-century château de Brémontier-Merval. The château de Bellosanne, built in 1827 on the old abbey site. The thirteenth-century chapel of St.Léonard at Merval. The eighteenth-century chapel of St.Marguerite at Bellosanne. Wikimedia Commons has media related to Brémontier-Merval. This page was last edited on 14 May 2018, at 18:49 (UTC).